Sizing Europe and Captain Cee Bee are set to renew their rivalry in The Irish Independent Arkle Challenge Trophy at Cheltenham on the opening day of The Festival, Tuesday, March 16, after both were among 47 entries for the two-mile championship contest. The Henry de Bromhead-trained Sizing Europe maintained his unbeaten record over fences after Captain Cee Bee fell at the last when travelling ominously well in the Grade One Bord Na Mona Nature Novices’ Chase at Leopardstown in December. 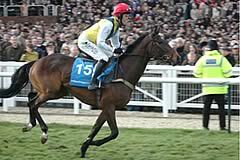 Captain Cee Bee’s fall left Osana, runner-up to Katchit in the 2008 Smurfit Kappa Champion Hurdle when trained by David Pipe, to take second place to Sizing Europe. This season Osana has been under the care of Edward O’Grady, the most successful current Irish trainer at The Festival, and prior to his Leopardstown second, the horse had won twice over fences at Navan. Michael Goodbody, racing manager to Osana’s owner Thomas Barr, commented today: “Osana is very much on course for The Irish Independent Arkle Challenge Trophy Chase. We are planning to run him in the Grade Two Flyingbolt Novice Chase at Navan on February 14, which will be his final prep before The Festival. “I don’t think you can complain about his first season over fences so far - whether he is good enough to win at Cheltenham is a bit of an unknown – but he is such a tough and consistent horse. Edward has been pleased with how he has taken to chasing and I think that the faster pace and the bigger field of a championship race, especially at Cheltenham, will play to his strengths. 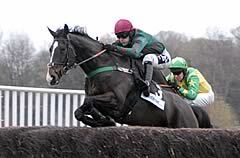 Captain Cee Bee landed the 2008 Spinal Research Supreme Novices’ Hurdle for trainer Edward Harty and owner J P McManus. The superb Arkle entry also includes fellow past Festival winners Mikael D’Haguenet (2009 Neptune Investment Management Novices’ Hurdle) and Cousin Vinny (2008 Weatherbys Champion Bumper) from the eight from the Willie Mullins yard. Champion trainer Paul Nicholls landed The Irish Independent Arkle Trophy with Flagship Uberalles (1999) and Azertyuiop (2003). He has five entries this year, headed by Tataniano, successful from the Nigel Twiston-Davies-trained Pigeon Island over the course and distance in the Grade Two Independent Newspaper Novices’ Chase on November 15. What is shaping to be an epic renewal of the Irish Independent Arkle Challenge Trophy could also feature the Henrietta Knight-trained Somersby and a whole bevy of contenders from Nicky Henderson’s Seven Barrows stable, headed by the outstanding French import, Long Run and the recent Kempton winner Mad Max. That triple Grade One winner, along with the aforementioned Mullins pair, are also engaged in the Grade One RSA Chase over three miles at The Festival on Wednesday, March 17, which has attracted 71 entries. Grade One winning hurdlers that have taken to fences this term and could start in the RSA Chase include the Henderson-trained Punchestowns, Mighty Man from the Henry Daly yard and the exciting Diamond Harry, trained by Nick Williams. Last season’s Grade One Albert Bartlett Novices’ Hurdle hero Weapons Amnesty, in the care of Charles Byrnes, could also line up at Prestbury Park, while the Renee Robeson-trained Ogee, victorious in the Grade One Sefton Novices’ Hurdle at Aintree is another that may attempt to lift the spoils. The enthralling staying novice chase division also includes the likes of Grade One winner Pandorama, Oscar Looby, Weird Al and the Francois Doumen-trained Doctor Pat, whose dam, Bilboa, finished third in the 2002 Smurfit Kappa Champion Hurdle. A massive entry of 80 has been received for the 140th Year of the National Hunt Chase, a novice chase for amateur riders over four miles, that also takes place on Wednesday, March 17. The historic race, the oldest at The Festival, is also potentially on Doctor Pat’s agenda, while others with dual entries in this contest and the RSA Chase include the Paul Nicholls-trained pair of Inchidaaly Rock and Forest Pennant. There is also Australian interest among the entries as Ginolad, another with an engagement in the RSA Chase, won the Victoria Racing Club Grand National and contested the Nakayama Grand Jump in Japan for Aussie trainer Aaron Purcell before joining the Venetia Williams yard. Williams has also entered the quirky but talented Mobaasher. Nigel Twiston-Davies could bid for back-to-back victories following Tricky Trickster’s success in 2009. The Gloucestershire handler has entered the smart Jaunty Journey and Petitfour. Jonjo O’Neill is the winning-most current trainer with five victories in the historic contest and he has entered four in a bid to increase his tally. The quartet is headed by Theatrical Moment and Synchronised.